Bond is the number 1 provider of 11+ practice, helping millions of children pass selective entrance exams. Bond Assessment Papers for 10-11 years are topic-based practice questions that set the foundation for success in SATs, common entrance or 11+ exams. 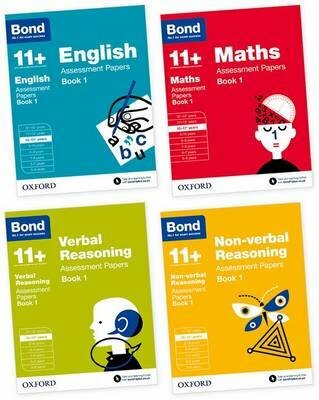 This bundle of four 2015 edition books provides comprehensive practice in English, Maths, Non-verbal Reasoning and Verbal Reasoning. They have been written to cover the core National Curriculum skills and cover the question types used in 11+ exams, building the skills and confidence for exam success. Each book includes: carefully graded practice papers providing essential practice of each question type in a realistic exam style; practical tips and next steps planner; a motivating progress chart; and a pull-out answers section - located in the centre of the book for easy removal.